Rewriting the rules for enthusiast computing, AMD (NYSE: AMD) today unveiled its new platform codenamed “Spider”, with the first true quad-core processor supporting scalable graphics for The Ultimate Visual Experience. The AMD Spider platform combines the introduction of AMD Phenom quad-core processors, ATI Radeon HD 3800 Series graphics processors with Microsoft DirectX 10.1 support, AMD 7-Series chipsets with CrossFireX and AMD OverDrive software. The AMD Spider platform is a major milestone on the path to Accelerated Computing, AMD’s vision for platform-level acceleration through co-processing. AMD’s Spider platform advances enthusiast computing by delivering the most sophisticated multi-GPU enthusiast platform ever with ATI CrossFireX technology. 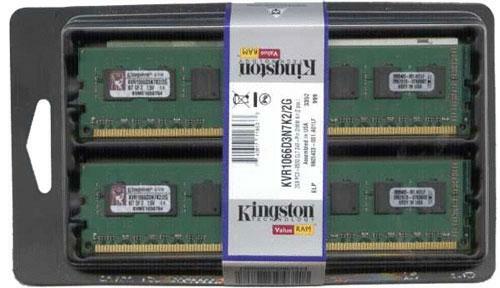 The combination of the energy-efficient 55nm ATI Radeon HD 3800 Series of graphics processors and the increased system bandwidth of PCI Express Generation 2.0 and HyperTransport 3.0 technology, provide optimal processing power for a scalable HD multi-GPU experience. AMD design and manufacturing innovation has enabled the AMD Spider platform to easily scale to three or four graphics processors and deliver a true gaming supercomputer. AMD is delivering the only platform that boasts major next-generation, industry-standard technologies to provide unparalleled bandwidth and balance in the delivery of next-generation HD content. With HyperTransport 3.0 technology, AMD Phenom processors have more system bandwidth than ever before with up to 14.4 GB/second of high bandwidth I/O. When combined with the additional bandwidth of AMD PCI Express 2.0 chipsets and graphics processors, the AMD Spider platform enjoys maximum bandwidth to support smooth 1080P video playback, enhanced multi-GPU and high-speed disk and network interfaces. With the only true quad-core processor and infrastructure flexibility with AM2+ socket, AMD processors are designed to be compatible with future 65nm and 45nm AMD Phenom processors to deliver key performance gains. Video enthusiasts can enjoy best-in-class HD entertainment on AMD Spider platforms with the addition of the powerful visual processing capabilities of the ATI Radeon HD 3800 Series. Striking image quality and power-efficient playback are made possible through the ATI Avivo HD video engine and the Unified Video Decoder (UVD). The addition of UVD ensures exceptional platform efficiency and image quality in HD-DVD and Blu-ray decoding for both H.264 and VC-1 specifications. Big screen gaming and entertainment is also made easy with enhanced HDMI connectivity with integrated HDCP and audio for HDMI video. AMD’s Spider platform offers a new class of enthusiast platform scalability, with multiple upgrade options to increase performance and boost compatibility with configurations that can deliver an estimated two teraflops(1) of desktop processing power by harnessing four graphics processors. The multi-core design of AMD Phenom quad-core processors, based on Direct Connect Architecture, features an integrated memory controller designed to support memory speeds up to DDR2 1066(2), 128-bit floating point units and AMD’s Balanced Smart Cache for rapid access to memory, with a shared L3 cache for leading-edge performance on multi-threaded software. The AMD 7-Series chipsets introduce the world to the latest ATI CrossFireX technology, a new class of scalable multi-GPU performance, supporting three or four ATI Radeon HD 3800 Series graphics processors for unparalleled upgradeability and DirectX 10.1 performance with the industry’s only tri- and quad-GPU solution for Microsoft Windows Vista. AMD 7-Series chipsets support up to four graphics processors and 42 PCI Express lanes, enabling maximum performance and upgradeability for gamers and PC enthusiasts. AMD 7-Series chipsets can deliver the ultimate in personalized enthusiast platform performance with AMD OverDrive(3) software, the industry’s most powerful and intuitive Windows operating system-based performance tuning utility. Through a simple Windows operating system-based interface, AMD OverDrive software can satisfy the needs of a wide range of performance-oriented users from enthusiast overclockers to mainstream gamers(3). In addition, AMD AutoXpress settings can increase your system performance when combined with enthusiast memory modules, ATI Radeon graphics, as well as AMD Phenom quad-core processors. 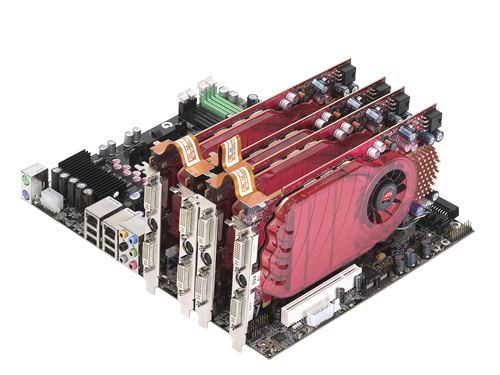 High-performing, energy-efficient AMD Spider platforms provide industry leading platform performance-per-watt, combining energy-efficient AMD Phenom quad-core processors for an improved computing experience, low power 65nm enthusiast AMD 7-Series chipsets, and low-power, high-performance 55nm ATI Radeon HD 3800 graphics. The AMD Spider platform also includes an unprecedented list of computing technology firsts and focus on power consumption, including: ATI PowerPlay, Cool’n’Quiet 2.0 technology, Microsoft DirectX 10.1 support, HyperTransport 3.0 technology and PCI Express 2.0. In a new initiative to measure real-world processor power consumption, AMD surveyed consumer and commercial users to understand precise usage patterns. AMD measured power consumption for these usage patterns and has found that AMD Phenom processors with Cool’n’Quiet 2.0 technology rated at 95W TDP can consume an average power of 32W for consumers and 29W for commercial users (4). For more information on the power consumption of AMD processors and platforms visit http://www.amd.com/coolnquiet. Enhanced features include AMD CoolCore technology, support for split power plane motherboard designs and the ability to set independent core frequencies. 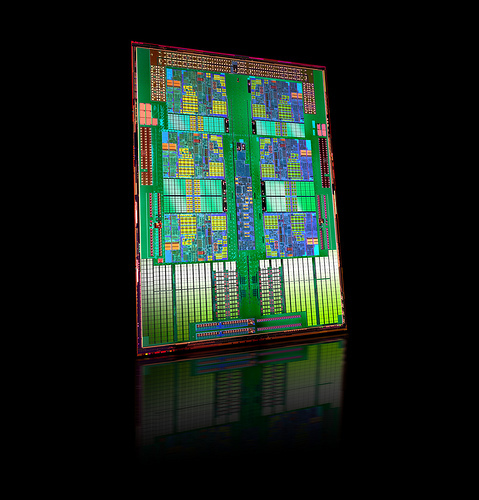 The AMD 7-Series chipsets are designed using 65nm process technology, a first for chipsets. With a TDP of approximately 10-12 watts, the 7-Series chipset offers world-class energy efficiency, allowing users to focus resources on processing performance. With a flawless transition to 55nm process technology, the ATI Radeon HD 3800 Series can deliver more than two times the performance-per-watt over the previous generation of AMD graphics products. In addition, ATI PowerPlay for the desktop allows for automatic power state adjustments for increased GPU efficiency when under moderate load or idle. All of these features contribute to better power optimization by enabling more efficient performance, lower power consumption, and quiet operation. 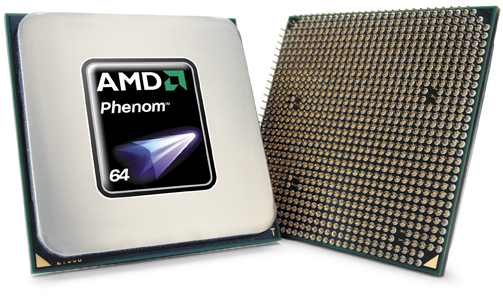 AMD Phenom processors 9600 (2.3GHz) and 9500 (2.2GHz) are now available for $283 and $251 respectively in 1,000-unit pricing. 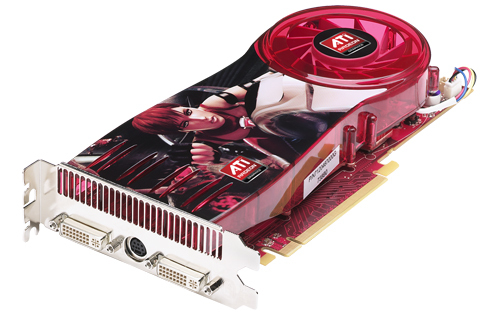 The ATI Radeon HD 3850 with 256MB of GDDR3 memory begins at US $179 MSRP and the ATI Radeon HD 3870 with 512MB GDDR4 memory from US $219 MSRP, available from AMD’s selected graphics products partners. For processor pricing details, please visit http://www.amd.com/pricing. For press collateral pertaining to AMD Spider and its components including product specifications and availability, videos, images and partner support, please visit http://www.amd.com/spider/presskit. Advanced Micro Devices (NYSE: AMD) is a leading global provider of innovative processing solutions in the computing, graphics and consumer electronics markets. AMD is dedicated to driving open innovation, choice and #27120 industry growth by delivering superior customer-centric solutions that empower consumers and businesses worldwide. For more information, visit http://www.amd.com. Based on internal AMD calculations of four ATI Radeon HD 3800 Series graphics processors in a system, each operating at 500gflops of processing power with an 800 MHz clock. Pending JEDEC specification approval and release. AMD’s product warranty does not cover damage caused by overclocking. AMD surveyed over 1200 users to determine consumer and commercial usage patterns (daily time spent on each application or at idle) in four countries. Corresponding application power consumption was measured in AMD labs, and the final power results were weighted by the time spent on each application. AMD directly instrumented motherboards to measure processor power consumption and used a wall meter to measure total system power consumption. AMD tested production AMD Phenom processors, AMD internal engineering motherboards with AMD 790FX chipsets, an ATI Radeon HD 3850 graphics adapter, 1GB of DDR2-800 memory, one 250GB 7200RPM HDD, one DVD drive, and a high efficiency power supply. Approximate weighting for consumer includes: Gaming 4%, Music Entertainment 4%, Transcode Multitasking 3%, Internet Content Creation 4%, Broad Based Productivity 36%, Media Playback Multitasking 4% and Windows idle 44%. Approximate weighting for commercial includes: Transcode Multitasking 2%, Internet Content Creation 3%, Broad Based Productivity 53%, Video Content Creation 1%, Image Content Creation 2% and Windows idle 39%. (C)2007 Advanced Micro Devices, Inc. AMD, the AMD Arrow logo, AMD Phenom, ATI Radeon, ATI CrossFire, ATI CrossFireX, AMD OverDrive, Cool’n’Quiet, and combinations thereof, are trademarks of Advanced Micro Devices, Inc. HyperTransport is a licensed trademark of the HyperTransport Technology Consortium. Microsoft and Vista are registered trademarks of the Microsoft Corporation in the U.S. and other jurisdictions. Other names are for informational purposes only and may be trademarks of their respective owners.